Hello and welcome to the 38th installment of the SWD. SAA Tiger Forces captured Umm Adasah, Lalat Muhammad, Tall Sous, Ahmadiya and Kabbariyah from IS thus partially besieging Deir Hafer. Partiall besiegement in this case means that IS can’t use any roads to enter/leave Deir Hafer but can still enter/leave on foot through the small corridor northeast of city. Today’s big advances do not match with previous small, careful advances over the past few days, Deir Hafer operation might be rushed so that Tiger Forces can sooner redeploy to Northern Hama to stop rebel advances. First to get the “less interesting” captures by SDF out of the way, east of Raqqa villages of Al-Ghassaniyah, Fatisat Bayam, Fatisat Abd Ismail and Mashrafat ash Shahnat were captured from IS. Interesting captures happened west of Raqqa, after the US helicopters transported around ~500 SDF fighters south of Euphrates, fighters also arrived through boats. Upon arrival village of Abu Horaira was captured and then villages of Hidaj, Al-Mushayrifah, Al-Jameen and Al-Krain were subsequently captured, also worth noting is that peninsula Jazirat al-‘Ayd was also captured. This wave of advances blocks SAA from advancing on Tabqa from Aleppo axis, one of the alleged long-term objectives of SAA in eastern Aleppo – western Raqqa region. Objective of this SDF south Euphrates incursion is most likely Tabqa city as the city is very difficult to capture from the current northern axis. Another important capture that came out of nowhere was Tabqa Dam, reportedly liberated by SDF forces backed by HAT (anti-terrorist special forces). As expected, HTS-led rebel offensive was able to steamroll NDF and capture a number of villages from them in a short period of time. 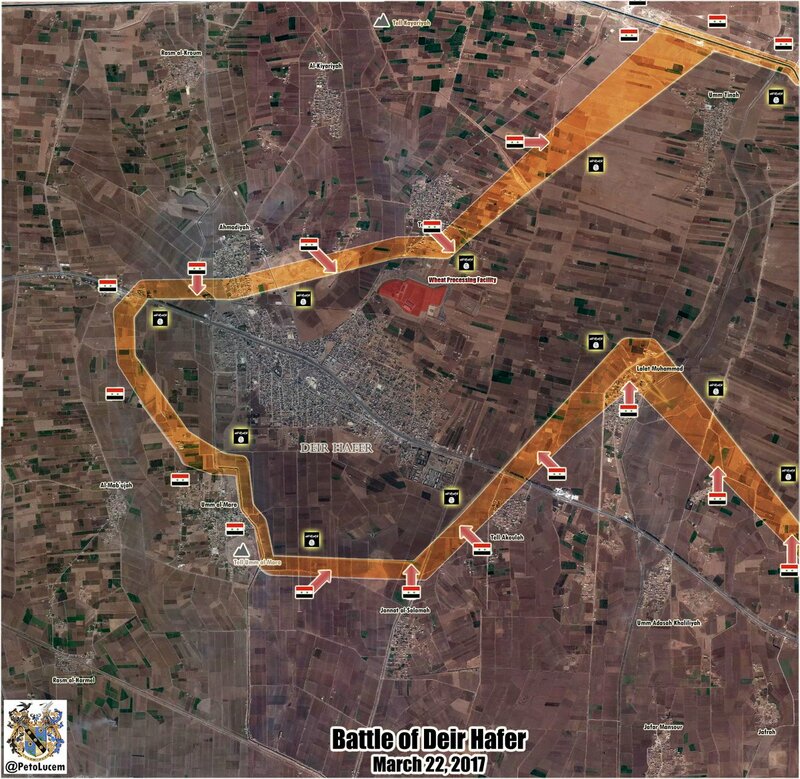 Early in the morning rebels held both Khattab and Souran towns and then continued to advance capturing; Khirbat Al- Hijama, Al-Ser, Majdal, Tell al-Sheyha, Azrah, Maarzaf, Zawr al-Balah and Kafr al-Amin. Rebels seized two checkpoints around Qomhana and tried attacking it, attack was repulsed by “NDF-Tiger Forces” hybrid, checkpoint north of Qomhana was recaptured. Later in the day rebels attacked Maardas, attack started with an SVBIED targeting “Russian missile battalion base” (not manned by Russians, just called that way) and quickly after the attack started Maardas was captured by rebels. There were numerous reports of rebels capturing NDF soldiers and some military hardware. Jaysh al-Izah claimed they destroyed three tanks just in Majdal area with TOW missiles. Objective of this offensive is still unknown, rebels might try and go straight for Hama or bypass it and link with Northern Homs which does look like the main axis of the attack, the Souran axis to the east might just be a distraction. We will just have to wait and see where advances occur next. After today’s advances by rebels, predominately Christian town of Muhardah is now surrounded from east and south by rebels. Even though rebels stated Muhardah is not the objective of this attack, one can not simply ignore the potential danger the city and its inhabitants face, since the attack is led by Al-Qaeda linked HTS which isn’t exactly known for their tolerance of religious minorities. SAA Tiger Forces are reportedly on their way to deal with this attack, reports suggest that Suheil al-Hassan, commander of Tiger Forces is already in Hama. This redeployment of Tiger Forces halts their eastern Aleppo offensive that might continue with other parts of SAA or allied militias leading the charge. Situation in Industrial District between Qaboun and Jobar is still a bit unclear. Pro-government sources claimed SAA expelled rebels from a part of factories area captured yesterday and rebels retreated from other captured areas, while pro-rebel sources claimed rebels were able to repel SAA‘s counterattack and situation remains the same as yesterday with rebels still holding on captured chunk of factories area. We will just have to wait and see After the fog of war clears hopefully in a few days it will be known what the situation is in Industrial District. Iraqi Army backed by PMU continued to advance northwest of Mosul capturing Al-Yaseen and Arihla villages as well as Badush bridge and the water plant in the direction towards Badush Dam. 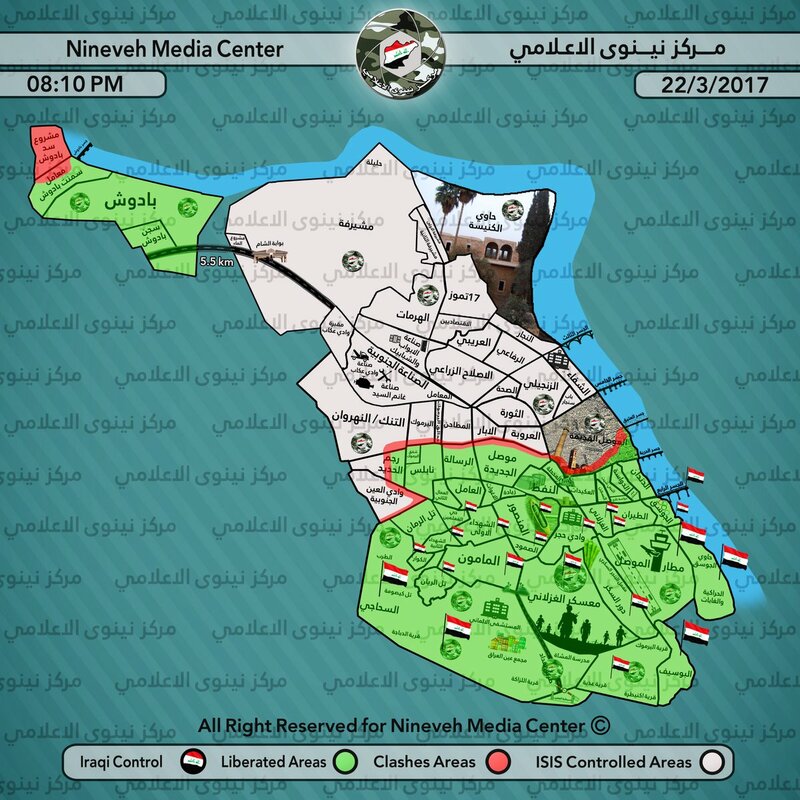 In the west part of Mosul, Iraqi Army made advances in Rajam Al-Hadeed district, clashes continue in “old Mosul”. On the 21st of March 2017 CJTF-OIR has conducted 22 strikes in Syria. CJTF-OIR‘s main focus in Syria at the moment is Deir al-Zour-Raqqa region where they did 19 strikes supporting SDF‘s operation against IS destroying four pieces of oil lubricant equipment, three barges, three fighting positions, three IS headquarters, two vehicle-bomb facilities, two vehicle-bombs, a vehicle-bomb factory, a tunnel, a vehicle, a weapons storage facility and a command-and-control node; and damaged two supply routes. Other area where three strikes occurred is Abu Kamal destroying three wellheads and a pump jack. Full report on CJTF-OIR strikes conducted in both Syria & Iraq can be found here.